Sneaky, sneaky Microsoft! When I agreed to install Internet Explorer 8 as part of a recent Windows update, I did not agree to make it my default browser. In fact, I wasn't even asked. In Firefox's Advanced settings, click the Check Now button to restore the browser as the default. 1. Close Internet Explorer if it's running, then start Firefox. 2. Click Tools, Options, then click the Advanced icon in the Options toolbar. 3. Click the General tab if it's not already selected, then make sure Always check to see if Firefox is the default browser on startup is enabled. 4. 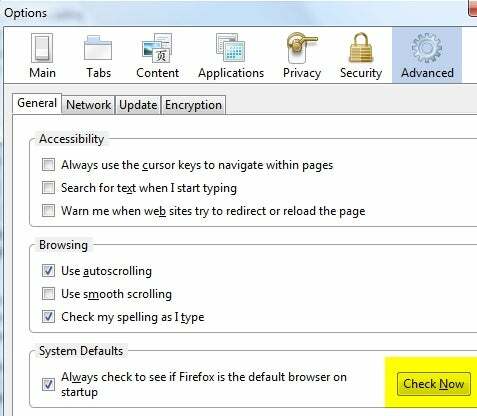 Click Check Now, then confirm that you want to make Firefox your default browser. 5. Click OK and you're done. So I have to ask: Did anyone else encounter this IE8 switcheroo? I'm a little surprised that it staged a coup without asking. Of course, I guess that's how coups work. I'm just happy that I was able to restore Firefox to the throne. Um, okay, these metaphors are just getting weird now. I'm not a court jester, after all. Update: Okay, I'm partially responsible for this. When installing IE8, I chose Use express settings, which, among things, makes IE the default browser. It says so right in the setup window (see below), but I didn't pay close enough attention. Ironically, I usually opt for "custom/advanced" installations, but here I stopped reading after Search provider: Google. Anyway, for all intents and purposes, Microsoft did "ask" before making IE8 the default browser, just not in the usual way. My apologies for any confusion.